So I just noticed the last couple times I turned off my return pump to clean the sump that I have a ton of white slimy like bacteria mulm or something like that coming out, only when I stop and start my return pump. I have my sump in my basement so there is a ton of PVC till it gets up to the DT. The white slimy stuff is gone within 1 hour of starting and stopping the return pump, I assume most of it is stuck back in the PVC and my filter socks. Do you think this because I am overdosing NOPOX (only dosing 10ml a day for my 180 gallon DT) and would using GAC help with his? I am thinking that I want to start using GAC to help my water get more clear but also thinking it may help with this too. 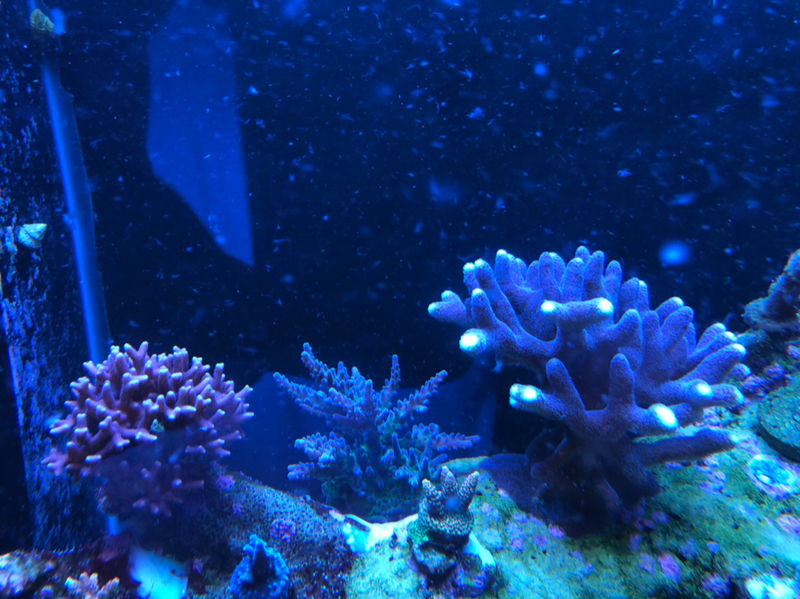 I am not that worried as I have never noticed anything bad happen to my corals or fish when it is going through my DT, just looks and feels disgusting and I would rather not have this. Does anyone have any suggestions on how to stop this from happening everytime I turn my return pump off. Can see it in the water column here. i had that too. I opened my return pump a bit more, and it got all cleaned out. Almost looks like pieces of fish. I had red goo in my sump from no pox. I turkey basted it off, cut dosage in half, and haven't seen it since. I do still occasionally get that white bacteria film on the water surface though. I haven't seen a negative effect on SPS. I have the white algae everywhere. Over the glass, in the sump. Nitrates 0 -1 have been 0 to 1 for probably 5 or 6 months. Have had the algae issue for same time period. Dosing 8ml a day on a 220 tank. Should i lower dose or stop dosing?